The Amazon Web Services (AWS) Institute today released a briefing paper that illustrates how cities are using technology to enhance access to services and quality of life for their residents. As cities become home to the majority of the world’s population, leaders must ensure that urban infrastructure and services can accommodate growth, and that no one is left behind. Increasingly, they are turning to cloud technology for solutions to the challenges they are facing – from problems like traffic, parking, and waste management to public health crises and natural disasters. 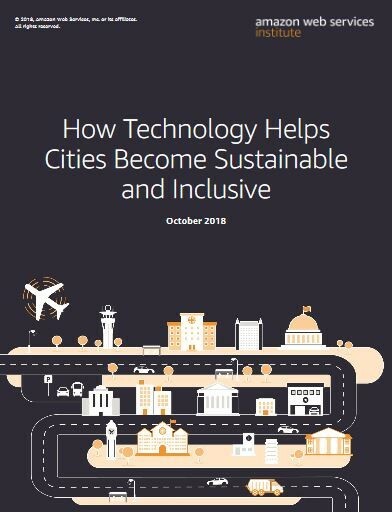 The paper, titled How Technology Helps Cities Become Sustainable and Inclusive, explains how cloud computing services provide the technological architecture needed for modern cities to become more responsive to residents’ needs. By offering a reliable, affordable, and secure technology infrastructure, the cloud allows city leaders to focus their time and resources on improving public services. This enhances government efficiency, innovation, and transparency. The cloud also helps leaders better analyze large volumes of data collected daily, and use it to inform their decisions and address urban problems. And importantly, technology is contributing to building more inclusive societies. The latest episode of the AWS Public Sector Podcast features the role of voice technology in connecting Canadian citizens with banking and financial literacy tools, regardless of their physical location or ability. It also highlights how a cloud-powered solution brings safer, more secure internet to rural communities in Canada. The subtext: with access comes opportunity. The paper goes on to discuss how healthcare organizations are teaming to support those struggling with drug addiction – a topic also explored on the podcast – underscoring the importance of making sense of data as a first step toward addressing this critical issue. Listen and read on to discover how the cloud is increasingly becoming a force for public good. Also, check out the AWS Smart Cities site to learn how other cities around the world are becoming smarter, increasingly connected, and more sustainable.